You can do just about anything with a bicycle. Ride down a mountain of stairs, check. Scream down a mountain pass road at 60 mph, check. Ride across the country, check. But did you know that bicycles are also great with wheels off the ground, resting on your shoulder as you hoof it up dirt hills with a 200 bpm heart rate? Yup, it’s true. You get to ride a whole bunch too, on varying terrain, in a pack of 50-100 or so riders. That’s cyclocross (or just ‘cross’ for short). Cyclocross is a combination of on and off-road cycling, combined with running, hopping, and mad-savvy bike handling skills, all on a bicycle that looks and feels like a road bike. And it’s muddy. Typical race terrain includes pavement, grass, gravel, dirt, mud, sand, stairs, ramps, and puddles. Oh, and there are wood barriers you have to hop over, often in succession and sometimes on the uphills. Don’t ask why. There just are. Cyclocross is as much about turning off your mind for 30-60 minutes as it is about having a laser focus on your immediate present. US Cyclocross season typically begins in autumn, just as temperatures are dropping and rain is picking up, and finishes up just as winter snow is beginning to fall. In Europe, cyclocross is a winter sport, often taking place on snowy trails. Races are as dependable as the US postal service (the mail, not the team), in nearly any conditions, from sunny and warm to raining sheets to frigidly cold and snowing. Some professional road riders have launched their careers by making a name for themselves in cyclocross, then proving themselves on the road. Think World Champions Zdenek Stybar and Lars Boom, or grand tour rider John Gadret. Each of them began their racing careers with cyclocross. Training for cyclocross is different for every rider (I know how helpful that sounds, but it’s true). 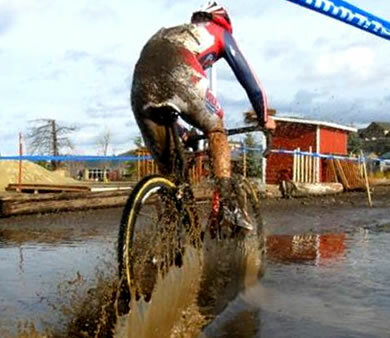 Many riders benefit from taking part in organized cyclocross practices. I used to attend these, but competitive nature being what it is, the well attended practices just left me tired. I find that easy road riding mixed with controlled hill interval riding works best for me. I used to mix in running and cyclocross practices so that I could get used to dismounts and remounts, and remind my muscles about running again, but since I started out as a competitive runner at a young age, running is in my bones. If you do the math, the amount of time spent running in a cyclocross race is so minuscule that training for the running might seem a bit ridiculous. I also found that practicing dismounts and remounts was helpful for a couple of seasons, but after that it becomes second nature, and no amount of practice was helping me do it better. The biggest factor in improving mounts was watching a video of it being done correctly. You can get the same experience watching the top racers. The key is in stepping onto the bike, not leaping. Your sensitive parts will thank you once you learn this. If you get serious about cross, you have to train specifically for each aspect of the racing. If you find a weakness such as keeping your speed on muddy, off-camber corners, you have to work on that until you master it. If your sprint off the line is weak, you have train your sprinting prowess. If your legs feel like logs after dismounting and running 10-20 steps, you have to mix some running into your training. If you have the opportunity to ride off-road on a regular basis, it’s best to do it on your cross bike so that you improve your cross-specific bike handling. If remounts are lacking smoothness, you have to practice until it becomes second nature. Like any sport, you get out of cross what you put into it, and if you enjoy training hard and reaping the benefits of that, cyclocross is a great sport to take part in; a great way to experience not only the weather elements but the elements of surprise and self-improvement. Cross rider running due to a broken rear derailleur. While a cyclocross bike may look like a road bike, it sports skinny nobby tires, fast geometry with a wider wheelbase and a bit more bottom-bracket clearance, and cantilever or disc brakes. You can get a look at my “old-school” aluminum Kona Jake the Snake here. Many cross bikes are now made of carbon fiber, though you can still find traditional steel or aluminum frames. Fully built, a cyclocross bike is a little tricked out, super lightweight, with personal touches that make you beam just a bit (mine glows in the dark). They tend to look a bit beefier than a road bike, in theory to better handle the mud and grit. That said, derailleurs and mud don’t much get along, sometimes resulting in broken parts. In the old days of cyclocross, riders would co-opt a touring frame and adorn it with knobby tires and old components from a friend’s basement. Basically, you took what you could get to craft a bike that would get you around the course in one piece. About twenty years ago, riders began building high-end bikes specifically for cross, such that you will rarely see a cheap ride at the races anymore. Having a cyclocross-specific bike is essential. Many riders try to fake it, at first, with a road bike, but it doesn’t work out. You need greater tire clearance at the brakes, chain stays and seat stays, and you can get that only with a touring or cyclocross frame. A mountain bike has that too, of course, but as cyclocross has developed, mountain bikes have not really fit the mold. 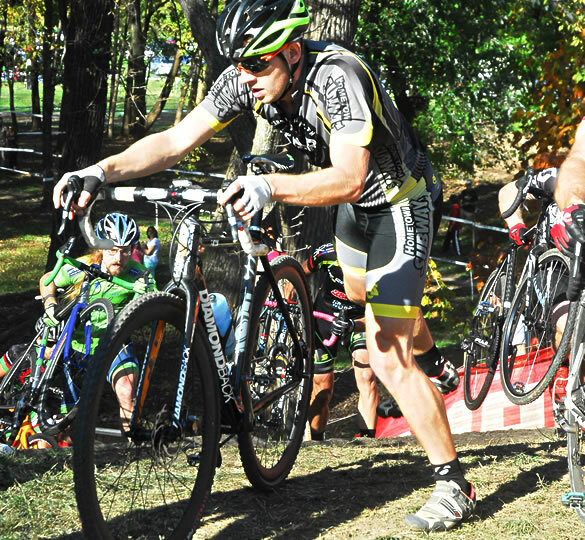 A cyclocross bike is typically lighter than a mountain bike too, making for easier shouldering and running. 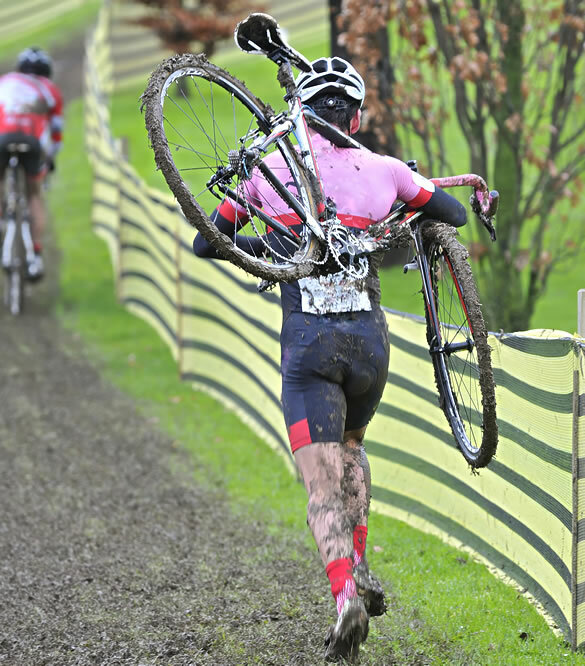 I tried using a modified road bike in my first cross season, but consistently wound up with mucked up works so bad I would have to stop mid-race to pull wheels out and remove clumps of mud and grass just to get the wheels turning again. Having a cyclocross mind helps too. Switch off, and have fun. It’s much easier to do that when your bike is purpose-built. Cyclocross used to be the off-season training and side show of road and track racing, but it is now it’s own show, the season many riders look forward to all year long. There is good reason for that, for cross allows riders to tap into both their adult physical prowess and their inner child sense of joy. Put simply, you get to ride your guts out while getting dirty, muddy, and sweaty, creating a kind of greasy sludge (or caked and baked dirt) on your bike and person. What’s not to enjoy? It is perhaps the human equivalent of being a pig, if pigs could ride bikes, that is. There are countless descriptions of cyclocross out there, so I thought I’d describe a race from the perspective of a [mostly] fit racer actually in a cyclocross race. The first thing you ought to know is that done right, cross hurts, but it’s a good kind of pain. Trust me. Cyclocross in the US traditionally has a casual atmosphere, so it’s common that the riders and commissaires know each other, and that the latter is not terribly upset if a rider shows up on the line with their number pinned upside down. Yes, I did that. Whoops. The start line is usually a casual affair, but once the guns fires, it’s game on. The mad dash off the start line is kind of insane, as it’s fairly rare that the hole shot winner actually wins the race. But people like starting fast, seemingly to break the legs off the people behind them. You might feel your lungs cry out for mercy. It is fair to say that your heart rate might just spike off the start line at a cyclocross race. Then it might stay there for an hour. One year, at district championships, I wore a heart rate monitor during my first race, and settling into the line after the start, I looked down to see my heart rate at 198. I had intended on taking it easy in the first race to warm up. Oh well. It is important to figure out some sort of race strategy so you don’t blow up early from the maximal efforts required. Remember, you’re not just turning pedals over dirt paths and pavement; you are switching up efforts between churning your pedals through rutted trails, mucky mud, gravel, sand, and grass; running up steep hills with 16-20 pounds on your shoulder, hopping over barriers bike in hand (or bunny hopping, if you can), and keeping a laser focus through the course’s surface, twists, and turns. Cyclocross courses tend to be different in length depending on the venue, with each lap taking anywhere from 5-10 minutes to complete. The number of laps raced is figured out at the race by the pace of the riders, calculated by referees who determine how many laps will fill a given space of time. Elite women race 40 minutes, Elite men race 60 minutes, and other categories race between 30-45 minutes. Lapped riders usually keep racing until they finish the lap they are on when the leader finishes. I used to regularly emerge from the first lap of any given cross race around tenth place, then fade spectacularly during the second lap, recover on the third lap, and surge forward on the fourth and any remaining laps. Eventually, I learned to just start at the back and slowly increase my pace throughout the race. You can avoid the mad hole-shot dash in this way. Sometimes I forget though because it’s all too easy to just try to stick with a group of riders, which is not all bad. In fact, often times, that is how you push yourself toward becoming stronger and improving. If you don’t blow up. If you can pre-ride the course, great. That will give you an idea of what to expect. What inevitably happens during a race, though, is that ruts develop in the surface such that the most logical line through a sharp corner may not be the smartest one to take. This is where switching off your mind might help. Just follow the ruts, and everything will be okay. Don’t quote me on that. There’s a thing that happens during a cross race where a kind of mystical magical energy might just take hold of you, lifting your riding ability to that of Wonder Woman or Superman. You might even feel like you are flying. It must be the endorphins. It’s a special zone where the run-ups seem nearly effortless, the barriers possess a reverse magnetism that helps you flit right over them, and the pedals seem almost to turn themselves as if motorized. It happens about once a season, maybe more if you are lucky or athletically gifted. My last race was mostly like that. It was my first race in nine years, and it felt great for 3 of 4 laps. The last lap was sheer pain, not the good kind, as my lower back had apparently remembered what it felt like to support my trunk by itself (a strong core is handy in cross). I lost five places in the span of a mile, but it didn’t much matter because I was having fun and being cheered on by familiar voices in the crowd I couldn’t see. Everything was a blur except the wheels and terrain in front of me. I felt a kind of joyful bliss. For me, that’s mostly what cyclocross is about. Joy on the bike, among friends. Pro cyclocross riders use the phrase “all day” when describing the weather, the riding, or basically anything about the race, and that’s because cross is so hard that 30-60 minutes can feel like all day. After a cyclocross race, you feel accomplished. You survived. Perhaps the simplest way to sum up cyclocross is with my old friend Jerry Baker’s words, “It’s the most fun you can have in the mud! !” Go try it. Be sure to train first. Build a bike. Enjoy! 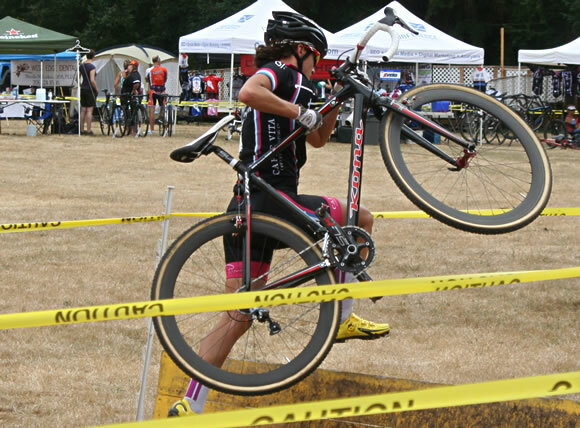 If you want to see what cyclocross is all about, and you are a woman (or a fan of a woman), be sure to attend the cyclocross clinic at Washington Women of Cross, organized in part by BikePT’s own Kari Studley.